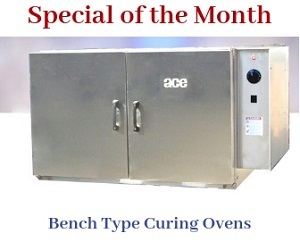 The ACE Model 4288-RT burn off oven is a safe and efficient product for the cleaning of industrial parts of different shapes and sizes. This model provides assurance of quick parts cleaning, as it does not damage the work piece. The oven is built to ensure immense durability, and is equipped with industrial quality cast iron burners. The 4288-RT burn off oven model has large inner dimensions, making it useful for heat cleaning of large metallic parts and components. This model offers combustible capacity of 60 LBS/HR at a normal cycle time of 2 to 8 hours. The optional One Touch Control (OTC) system offers effortless operation of the oven. Peruse the following tables to understand more about the oven and its technical specifications. 2 Top Mount Pressure Relief Hatches 22.17 SQ. FT.
5 Gas Inlet Pipe Size 1-1/4"
The oven monitors the development of any harmful gases, and eliminates them with the help of the primary afterburner, which operates up to 1,500°F temperature.